The initial phase of planet formation - the growth from (sub-)micrometer sized dust grains to macroscopic aggregates - is still not understood; no one knows how large these aggregates can really grow by collisional aggregation. Many dust collision experiments were performed in the recent years (see review by Blum and Wurm, 2008) but so far we only had a conclusive recipe for the fractal growth up to approx. 100 μm sized aggregates. For collisions among larger and non-fractal aggregates, the collisional outcomes are very diverse, which makes it hard to utilize these results for any growth simulation. In this project, we construct a conclusive model which is then implemented into a Monte-Carlo based growth simulation (Zsom and Dullemond, 2008; Zsom et al., 2010; see also project C2 of the Forschergruppe). In Güttler et al. (2010), we compiled 19 individual dust aggregate collision experiments to make them available for implementation into a computer model. We found that we have to distinguish between 9 different types of collisional outcomes (Fig. 1). 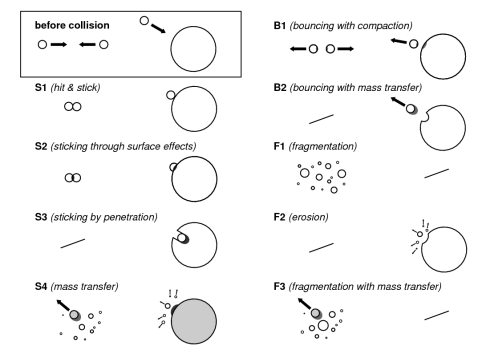 These outcomes were observed in the collision experiments and include sticking (S), bouncing (B), and fragmentation (F). For all of these types we can give a quantitative outcome (i.e. in terms of porosity evolution, mass transfer, fragmentation size distribution). Fig. 1: Possible outcomes in dust aggregate collisions [click to enlarge]. A useful model should also make a prediction of a collisional outcome for any arbitrary set of collision parameters (i.e. mass, velocity, porosity). Therefore, we determined the parameter range in which the single collision types occur. The thresholds between sticking, bouncing, and fragmentation are based on experimental observations and extrapolations. Figure 2 shows an example how we discriminate between the different collision regimes introduced in Fig. 1. 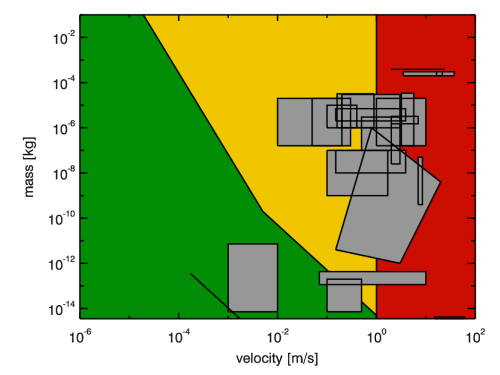 The green areas show regimes where we expect sticking (S), yellow denotes bouncing collisions (B), and red areas show where collisions lead to fragmentation (F). The grey boxes show the parameter ranges of the 19 included experiments. Fig. 2: Schematic of the collision model. However, the model from Fig. 2 is oversimplified as the experiments also showed that we have to distinguish between (i) porous and compact collision partners and (ii) similar-sized and different-sized collision partners. One example is the sticking by penetration (S3) and bouncing with mass transfer (B2) (see Fig. 1), which only occur for different sized collision partners, where the larger aggregate (target) is porous. This leads to the discrimination in Fig. 3: on the left side, all porous/compact combinations of similar-sized aggregates lead to four different regimes. The same for the different-sized aggregates on the right leads to a total of eight different collision regimes. These regimes were independently evaluated according to the thresholds between the collisional outcomes which yields eight different panels comparable to Fig. 2. All eight figures and the exact threshold lines can be found in Güttler et al. (2010). The presented collision kernel has been successfully implemented into a Monte-Carlo growth model (Zsom et al., 2010) which shows up the growth path for protoplanetary dust aggregates. The simulation also shows that the growth comes to rest as soon as the aggregates reach sizes of millimeters to centimeters. The reason for this quasi-equilibrium is that for those sizes bouncing is the dominant collisional outcome so we speak of the bouncing barrier. From the Monte-Carlo simulation we learned, which collisions are important and so far not covered by experiments. The main goal of this project is to design collision experiments according to the results of the Monte-Carlo simulation. Thus, we are aiming to understand a complete growth path of dust aggregates in which every collision is backed by an associated laboratory experiment. Although the bouncing barrier is covered by many different laboratory experiments, the broad parameter range (see yellow area in Fig. 2) needs further investigation. First we have to make sure that we really see bouncing in all collisions that occurred in the simulation. Secondly, bouncing leads to a significant compaction of the porous dust aggregates and the compaction model is so far based on only one experiment (Weidling et al., 2009). Thus, we are currently performing new experiments on the bouncing and compaction of dust aggregates in so far unknown parameter regions. The sticking threshold (line between green and yellow region) is either a wide extrapolation from experiments and simulations of fractal aggregate collisions (in the case of hit-and-stick) or based upon vague model assumptions (in the case of sticking through surface effects). As the sticking velocity is expected to be very small, sticking could so far not be systematically observed in laboratory experiments. Thus, experiments to deduce this sticking threshold - on which the growth ultimately depends - are also ongoing.